LS17_227, 2017. 21 x 22 inches. LC18_207, 2018. Layered and torn archival pigment prints, 13 1/2 x 24 1/2 inches. LS17_193, 2017. 16 1/2 x 20 1/2 inches. LF17_176, 2017. Archival pigment print with vellum and mixed media, 16 1/2 x 22 1/2 inches. LS17_213, 2017. 21 x 22 inches. LS17_194, 2017. 16 1/2 x 24 inches. LC18_266, 2018. Archival pigment prints, 21 x 26 1/4 inches. LS17_222, 2017. 16 x 19 inches. LF18_267, 2018. Archival pigment print with vellum and mixed media, 19 1/2 x 18 inches. LG17_231, 2017. Archival pigment prints with vellum and mixed media, 12 3/8 x 16 1/8 inches. LC18_276, 2018. Archival pigment prints, 18 5/8 x 12 3/8 inches. 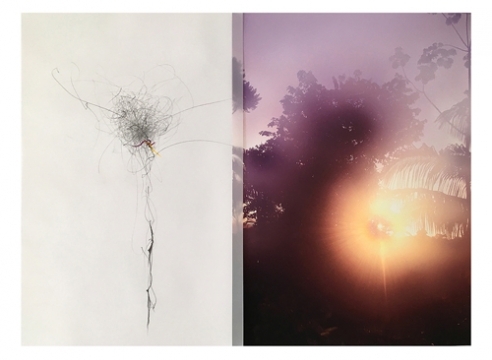 Yancey Richardson Gallery is pleased to present Lineations 2, an exhibition of new photographs by Sandi Haber Fifield. In these recent works, the artist combines torn and layered photographs, graphite, wax pastel and vellum to shift our understanding of photography away from the fact-based or documentary, towards a material-based, intuitive process which challenges our expectations of the expressive potential of the medium. Haber Fifield has experimented with multiple images throughout her career, exploring various ways of extending the photographic frame. As Haber Fifield explains, “I have never felt constrained by the parameters of traditional photography and have only rarely been interested in pursuing photography as fact." In Lineations 2, Haber Fifield uses the camera to capture light, shadow, line and plane, as well as details from the natural world. Treating the resulting imagery as raw material, Haber Fifield may adjust the photograph’s color, overlay different versions of the same image, or use the ragged white edge of a torn segment as a line. In many cases, on either the photograph or an adjoining sheet of vellum, the artist adds drawings in response to and as an extension of the altered images. The drawings are both intuitive and insistent with a line that is spindly and brittle as well as elegant. The vellum adds another layer, translucent and atmospheric, that one looks both at and through. The interplay of shadow and substance seen in the photographs, as well as in the layering of opaque and translucent materials, echoes the photographic process itself, for which both light and darkness are essential. Sandi Haber Fifield was born in Youngstown, Ohio in 1956, and she lives and works in New York. Her work is the subject of three monographs: After the Threshold (Kehrer Verlag); Between Painting and Picking (Charta); and Walking through the World (Charta). Haber Fifield’s work has been widely exhibited in galleries and museums throughout the United States including The Art Institute of Chicago; The De Cordova Museum, Lincoln, MA; The Museum of Modern Art, New York; The National Museum of American Art, Washington, D.C.; The Oakland Museum; The Southeast Museum of Photography, Daytona Beach, FL; and The St. Louis Museum. Her work is included in numerous major public collections including The Art Institute of Chicago; The Museum of Modern Art, New York; The Brooklyn Museum, New York; The Philadelphia Museum of Art; The Los Angeles County Museum of Art; and The High Museum, Atlanta.